Associated Students senators focused on postponing transition to new elected officials and improving the internal offices of the association at their most recent meeting on Wednesday, May 11, when 12 new bills and resolutions were introduced. Two of the most pressing resolutions came from College of Letters and Science Senator Heather Vest, in collaboration with Off-Campus Senator Louis Mariano and A.S. President Jimmy Villarreal. A Resolution to Create A Presidential Commission and A Resolution to Extend A.S. Transition both passed, despite some senators’ concerns about whether the senate has jurisdiction to alter these components of the A.S. transition. Submitted minutes before the meeting began, both resolutions tackled how A.S. would make its transition from the current A.S. officers to the recently elected 2016-2017 officers. Traditionally, the next academic year’s executives and senators are sworn in during week eight of spring quarter. However, since the University of California, Santa Barbara’s Audit and Advisory Services office has yet to conclude its investigation of the Inter-Fraternity Council, the UC Board of Regents and Chancellor Henry Yang have not yet certified the 2016-2017 A.S. elections results. The first resolution directs Villarreal to create an unbiased ”Villarreal Election Commission,” made up of voters who did not campaign for office or work in a political party, representing the three A.S. branches: executive, judicial and legislative. The commission will make the final decision on how the association should proceed after receiving the results of the investigative report. Under the resolution, Villarreal will also be able to swear in all new executive officers and senators himself should the current officers be unavailable to do so over the summer. The second resolution addresses the traditional week eight swearing-in. Per its terms, the 2015-2016 executives and senate will remain in power until week nine. The Villarreal Elections Commission has full jurisdiction over how A.S. conducts business if the investigation is not completed by week nine — or if they receive the final investigative report, on making a final decision on the 2016-2017 elections and swearing in new officers. Under Villarreal’s direction, the association will move $5,000 from its leadership account in the A.S. budget to accommodate for the extra week that the 2015-2016 officers will serve. The money will pay for a week’s worth of honoraria for the “entire leadership of Associated Students’ honoraria earning students,” according to A Resolution to Extend A.S. Transition. Villarreal said that he will send out an association-wide email every Monday informing students, faculty and staff of any updates pertaining to the investigation. Marquez said the officer transition delay is unprecedented and reported that staff members who have worked on campus for more than 25 years told her they did not recall such a delay occurring prior to this year. Some were unhappy about how long the investigation and transition have taken so far. 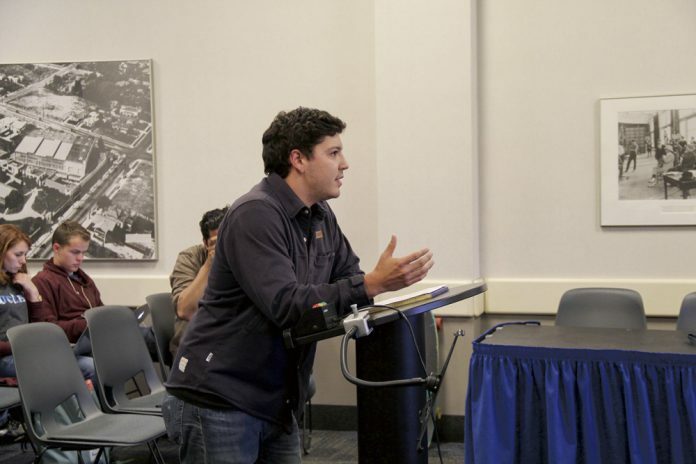 Former Senator Liam Stanton spoke at public forum, denouncing the association for diverting resources and time to the investigation over other issues that students are more concerned with. Villarreal will continue to work with Audit and Advisory Services as it releases more information about the case. Villarreal and President-elect Austin Hechler sent out an association-wide email on Friday, May 13 addressing updates in the IFC investigation. A living The Bottom Line fossil, 2017-2018 Editor-in-Chief Gwendolyn Wu is a fourth year double majoring in history and sociology. She is most likely multi-tasking and inhabiting the couch in the newsroom as you read this bio.